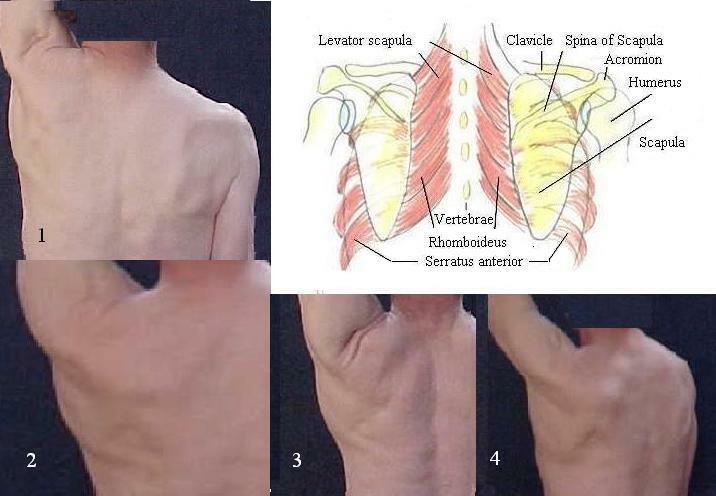 Figures 1 to 4: Maximal lifting and stretching of the arm involve a clockwise rotation of the scapula of about 20 degree, a lateral and forward movement of the lower angel of the scapula and a slight back-inclination of the thorax. The left border of the scapula and parts of the teres mayor become part of the upper lateral thoracic border once the whole process of stretching is completed. The main muscle involved in the rotation of the scapula is the serratus anterior arising from the lateral part of the thorax and connecting to the medial border of the scapula.